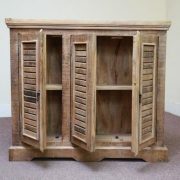 Attractive solid wood two drawer, two cupboard sideboard. 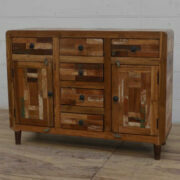 This two drawer, two cupboard sideboard has wooden handles and a rich mid brown tone. 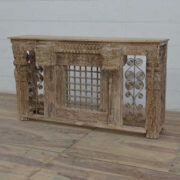 Perfect in the dining room for serving food, for displaying serving dishes and photographs, and for storage. 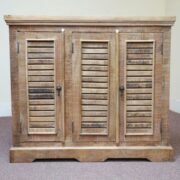 The drawers on this one are deep, each cupboard has one shelf and the doors close with magnetic catches. 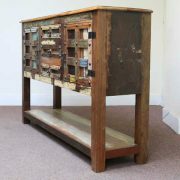 Handmade in India from reclaimed timbers, we call the style Retro Rustic – it’s got round, angled legs, and a retro fifties feel that’s finished in distressed rustic colours in greens, blues and creams. 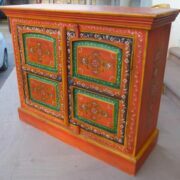 It’s warm and fun and reflects the colours and culture of Rajasthan, India. 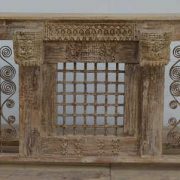 These eco-friendly items are made from a mixture of reclaimed timbers from India, including the use of teakwood, sheesham and mango wood. Usually they show various colourings, with many blues, greens, creams and sometimes oranges, red and pinks. Therefore even the same designed item looks completely different. 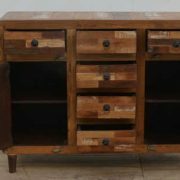 The woods have been obtained from old Indian buildings such as factories and Havalis etc and therefore is a fantastic environmentally friendly option in furniture making. 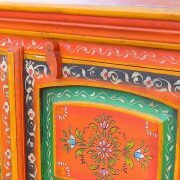 They are made in Jodhpur, India. 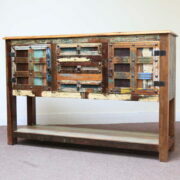 Due to the nature of these pieces each item will vary, with the colours on the wood differing from one to another. Please contact us prior to purchase if you would like let us know your preference and see photos of the exact item we would send you.